After trying a handful of beauty hacks (if you need to catch up, check them out here, here, here and here), I FINALLY found one that I am over the moon excited about. Okay so, how many times have you had that perfect blush or eyeshadow and you clumsily drop it on the bathroom floor and it breaks into tons of pieces? For me that happened more often than I would like to admit.. I would try to rub the broken pieces on my face to salvage the makeup (which is actually kind of embarrassing soooo maybe try to erase that picture from your mind). Well, I have the answer for you. All you need is a few things you probably already have laying around your house! First of all, take your (insert broken makeup product) and put saran wrap over it. Use the opposite end of one of your makeup brushes and crush it up even more. The smaller the chunks the easier it is to mix later. 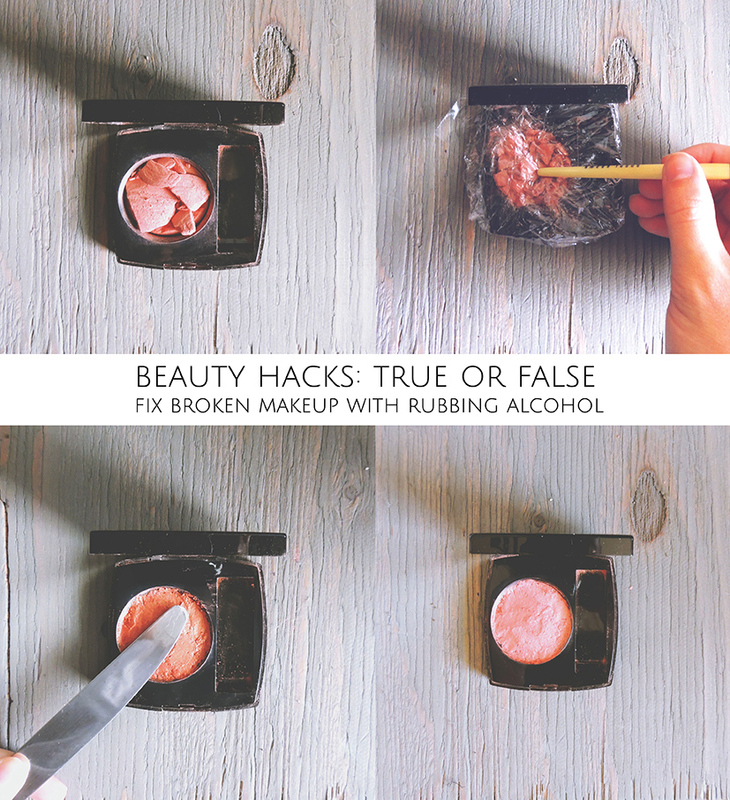 Squirt a bit of rubbing alcohol right into the broken makeup (you will know how much because of the consistency). Use a butter knife to smooth this out and leave to dry overnight. And I love it! It is a bit softer than before, so make sure not to be too heavy-handed when putting it on your brush or you will look like I do after a long day at the beach.. sunburned like a lobster! Other than that it is perfect and will be so helpful in the future.